Americans who understand the challenge of climate change had to be encouraged by the Paris summit, where the nations of the globe, including the United States, pledged to work together to dramatically reduce the burning of fossil fuels – before it is too late to avoid disaster. Activists who want the U.S. to do our part must confront a massive roadblock: the Republican majority in the House, Senate and many statehouses. These conservatives, funded by oil company political contributions, deny that global warming is even a reality or a problem – and they actively block every legislative strategy for change. Do you want to cut the huge tax incentives that promote carbon-based energy? Republicans, pocketing Koch brothers’ money, just renewed those subsidies. Do you want public investment to retool the economy for renewable energy? Conservatives believe in austerity and cutting public spending. But hold on. This is a fight we can win: a serious fight for public investment – to retool our energy economy and the jobs of the future. Americans care about good jobs. Most people also intuitively understand that shifting from a carbon, pollution-based energy system to a clean renewable energy system will require spending money. And they know in their bones that the transition to green energy and efficiency will create good jobs in a sustainable economy. In his great new book, “Greening the Global Economy,” economist Robert Pollin demonstrates that modest but steady public investment in green energy production and conservation (over the next several decades) is absolutely necessary in order to get our economy operating at close to zero carbon pollution. While acknowledging the role of the private sector (especially as solar and wind come down in price), he shows how public investment is essential to leveraging the scale of private and community investment necessary to retool our energy, transportation and housing infrastructure to achieve the goal of greatly reducing carbon pollution in America and the world. His book also lays out the huge numbers of good jobs such a retooling would generate – jobs for poor and working-class and middle-class people, all those who lost out during the Great Recession and our long period of economic stagnation and growing inequality. These protest movements do raise the costs of dirty fuels somewhat – and they send a political message that average folks, indigenous peoples, farmers and ranchers don’t want dirty energy development. But once we raise consciousness, we need to build a movement for public investment in massive conservation and for replacing carbon energy with renewables. As we have noted, the strongest message dirty energy conservatives put forward against change is, “What you are calling for will kill jobs.” But as workers know well, jobs in the dirty energy sector last only as long as there is coal or oil to extract. The plan advanced by Pollin would generate millions of good jobs in new, cutting-edge and U.S.-based manufacturing sectors. The levels of investment he calls for would stimulate sustainable economic growth, overcoming chronic tendency of the world economy toward “secular stagnation” lamented by institutions like the International Monetary Fund and economists from Larry Summers to Joseph Stiglitz. Most importantly, the investment plan proposed by Pollin would give working Americans new hope – and it would give our public institutions a positive new leadership role, from Congress to state legislatures to local school boards. The movement we will need to reverse global warming needs to be led by Americans fueled by hope for a better life and new opportunities. We all know that even with a president committed to addressing climate change, we can’t make the big investment changes we need with a Congress dominated by people who don’t even acknowledge the problem. This explains why many progressive groups (and the White House) focus on organizing and education work that does not require congressional action. But polling shows enormous public support for a political movement to defeat climate-deniers and to replace them with leaders pledged to invest in green energy and to create a new generation of good jobs. ● Invest in clean renewable energy to create jobs and reduce dependence on oil. If the pro-investment candidate says these investments will be funded by “closing tax loopholes for big corporations and the rich,” then he or she wins by a decisive 23-point margin (62 percent to 39 percent) over an opponent who says we can’t afford those investments. Presidential candidates Bernie Sanders and Hillary Clinton have both advanced investment plans aimed at retooling the U.S. economy to dramatically reduce carbon pollution and increase our dependence on renewable energy – and to expand our capability to produce those technologies domestically. As we decide who has the best plan and campaign to win the White House, progressives also need to launch a campaign to win back a congressional majority committed to a bold agenda for stopping climate change and creating new green jobs. 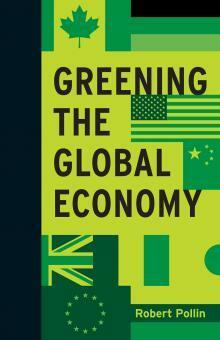 To see the detailed agenda for change, buy and read “Greening the Global Economy.” Let’s re-launch the green jobs movement by making the book a best-seller. Buy it at Amazon. Or if you want an e-book, go to MIT Press.